Indoor bowls shoes perform two essential functions. Firstly, they protect the playing surface from damage as players walk up and down the rink. Damaging the playing surface of an indoor rink could potentially affect how the bowls travel and hence interfere with the game itself – which is why wearing specialist indoor bowls shoes with completely smooth soles is compulsory. But secondly, they provide essential support and comfort during long periods of being on your feet, combined with the flexibility you need during play, enhancing the delivery position. Suppliers go to great lengths to enhance the comfort of indoor bowls shoes, with some models including magnet soles to aid circulation and air bubbles to help cushion the foot. Specialist indoor bowls shoes are made by most of the major names in bowls. Henselite, Drakes Pride, Emsmorn, Welkin, Greenz, Taylor and ComfitPro all make or supply them and you can find models from all these suppliers here at Bowls World. The compulsory nature of indoor bowls shoes, combined with the limited colour options (only white, grey or tan) might suggest that you won’t have much choice when it comes to making your purchase. But in fact the range of styles available has expanded hugely over the past few years allowing you to pick a style that fits the rest of your attire and personal style. The major style trends available for men includes trainer style (either laced or velcro fastenings), conventional lace up shoe style (you could probably wear the grey or tan ones to the office without anyone noticing), slip on style (which also look much like a conventional shoe), and moccasin style which offer a more casual look. For women the choice is even wider, with the major style trends including all those mentioned for men, but with usually more variation within a style, plus the sandal (e.g. Greenz Miss Kool Sandal) which offers all the functionality you need in a very feminine style. In terms of colour, white, grey and tan remain the staple colours but here and there you can find a bit more variety, such as the Drakes Pride Cosmic Ladies Trainer which is white with a choice of blue, pink or silver trim. 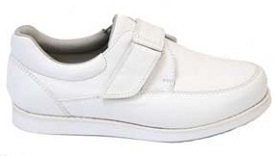 Bowls World sell a good range of men’s and ladies bowls shoes in a variety of styles to cater for most tastes. All Emsmorn Freestyle shoes have wider fitting and are exceptionally comfortable and supportive with a light weight and flexible PU sole unit providing essential grip on all surfaces in both dry and wet conditions, half size girth adjustment to ensure a correct fit for both feet, and an anti-fungal inner sole liner for odour reduction. Henselite Tiger Sports shoes have an air bubble in the heel to cushion the feet. Drakes Pride Solar shoes are in the traditional trainer style, flexible and very light. Welkin Winner Shoe: Moccasin style lace up / slip-on in soft leather. Emsmorn Freestyle Harmony: Traditional semi-moccasin slip-on shoe style, ultra soft leather. Emsmorn Freestyle Libra: Traditional lace up shoe style, soft napa leather. Drakes Pride Solar: Lace up trainer style. Drakes Pride Cosmic: Lace up trainer style with choice of blue, pink or silver trim. Henselite Tiger Sports: Lace up trainer with side detailing. 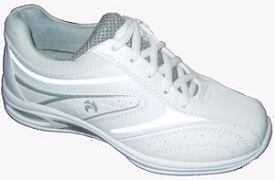 ComfitPro Ladies Champion: Lace up trainer with leather upper, tongue and liner. 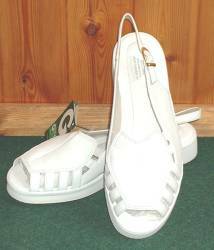 ComfitPro Ladies Elegance: Velcro fastening trainer. Greenz Camille: Semi-moccasin style lace up, leather with openwork front panel. Greenz Vicki: Semi-moccasin style slip-on with openwork front panel. Greenz Miss Kool Sandal: Sling-back sandal with open toe. Emsmorn Freestyle Quantum: Traditional semi-moccasin slip-on shoe style, ultra soft leather. 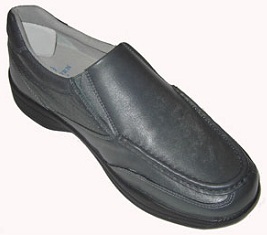 Emsmorn Freestyle Capricorn: Traditional slip-on shoe style, napa leather. Emsmorn Freestyle Taurus: Traditional lace up shoe style, napa leather. Emsmorn Freestyle Premier: Velcro fastening semi-trainer style, napa leather. Greenz Bias: Semi-moccasin style lace up, leather with needlepunch front panel. 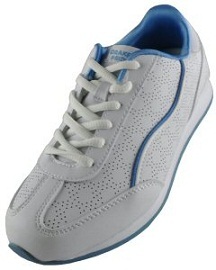 ComfitPro Achieva: Lace up trainer, microfiber with leather lined tongue and lining. ComfitPro Reactive: Lace up trainer, leather interior. ComfitPro Saturn: Lace up trainer, leather interior.